The detached house is a very common building typology in Belgium. Unfortunately these dwellings display very high levels of energy consumption because of their large heat loss surfaces. 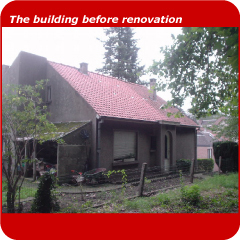 This project shows that it is possible to obtain a relatively low level of heating consumption by properly insulating these dwellings. However, it should be noted that the corresponding costs are usually higher because both the insulation surface and the number of window replacements are larger. The owners had no notable knowledge with regard to durable construction and renovation, but succeeded in bringing the project to a favourable conclusion by their interest, perseverance and constant inquiries. One of the owners priorities was to provide a healthy indoor environment for their children and lead to the installation of a balanced ventilation system, bioruptors to minimise electromagnetic pollution and choosing healthy materials on the inside of the building. Although certain aspects might have been pushed further, the project constitutes a nice challenge.